The following are highlights and some photos from a busy 2006 (before we had a blog). Dec. 10 – Second Annual Libertad Speaker and Fundraiser with Julia Alvarez, novelist, poet, and most recent author of Saving the World. Sponsored by the Lintilhac Foundation and hosted at the home of Crea and Phil Lintilhac of Shelburne, Vermont. Dec. 1 – World AIDS Day – University of Vermont Student Athletes For Equity (SAFE) hold an all-day juggle-a-thon on the UVM campus to raise awareness about HIV/AIDS and raise funds to support Futbol para la Vida HIV/AIDS prevention education program. Nov. 30 – Fundacion de Libertad co-hosts the third annual screening of A Closer Walk at the UVM Campus Community Theater with the UVM Center for Health and Well-Being. Oct. 15 – Batey Libertad men’s soccer team travels to Montellano (outside Puerto Plata) for a soccer game and celebration. BL wins against a big rivalry. Thanks to John Antonucci and the soccer teams of U32 in Montepelier for supporting the match with a juggle-a-thon back in Vermont. Oct. 6-7 – Batey Libertad community health clinic coordinated by Dr. Pat Erickson with patients seen by Dr. Ara Fernandez of Columbia University and volunteers from the children’s hospital of Santiago. Thanks Ara and friends for a fabulous clinic. Sep. 30 – University of Vermont team participates in annual AIDS Walk in partnership with Vermont CARES to raise money for Grassroot Soccer programs and coaches training in the DR.
Batey Libertad HIV/AIDS educators work with the Dominican DREAM Project in Cabarete as counselors during a 5-week summer camp for kids. Milanda, Wilson, and Nico initiated and ran a full Grassroot Soccer program for multiple age groups during the camp. Thanks to the Lintilhac Foundation of Shelburne, Vermont for making a critical donation to make this happen. June 17 – World Cup Soccer fundraiser at Ri Ra’s Irish Pub in Burlington, Vermont. A huge thanks to Ri Ra’s for hosting our raffle during the USA v. Italy match, and to the many Burlington businesses who donated items, including the Outdoor Gear Exchange, Ski Rack, Yoga Vermont, Capital Soccer Club, Donny’s Pizza, Olympia Sports, and New Horizons. June 1 – Grassroot Soccer HIV/AIDS prevention education curriculum demonstration by Yanlico of Batey Libertad at Punta Cana, DR, hosted by the Punta Cana Resort and Club at two local schools. Batey Libertad Women’s Group initiates a candle-making enterprise to raise money for visas and passports in order to obtain jobs and earn cash income in Dominican society. If you’re interested in supporting this project and purchasing hand-crafted candles, please contact Jon Erickson at the University of Vermont. Batey Libertad hosts a formal “training of trainers” HIV/AIDS prevention education workshop, educating coaches from Libertad, the Dominican DREAM Project, and Proyecto Adames in the Grassroot Soccer curriculum and method of education. 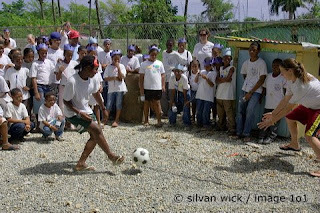 A huge thanks to Paola Peacock Villada from Grassroot Soccer for running the training, and to Norm Lerchen, Tricia Suriel, and University of Vermont students for raising the funds to make it happen. Batey Libertad fundraiser and 7 x 7 indoor soccer tournament held in Shelburne, Vermont. A huge thanks to Nooch, Sara, and Kari for organizing the tournament and raising funds to support the upcoming Grassroot Soccer “training of trainers” in the DR. The local school and health clinic construction at Batey Libertad is finished. 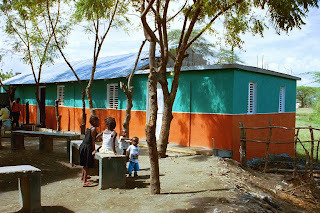 The building was inaugurated with a community-run health clinic coordinated by Pat Erickson and has since hosted local school classes, numerous community celebrations, health clinics by visiting medical missions, and emerging local enterprises, including candle-making by the Batey Libertad Women’s Group. The new local school and health clinic building is nearing completion. This project started with a UVM fundraiser less than a year ago, and next month will see it’s first classes and community health clinic. Monthly highlights from 2005	Fundación de Libertad is born!